The celebrity chef's newest enterprise opened on June 2 and for the time being it needs its owner's attention. "It's like a baby," he says of the 130-seat restaurant with an exterior so eye-catching you'll think it belongs in Times Square, not a suburban strip mall. It's 7 p.m. on the first Wednesday in June and the lineup at Vij's is two hours long. Those at the back of the queue may not know it but they could hop in a car and drive 45 minutes to find food prepared by the same cooks as the famous Vancouver Indian restaurant. Not only that, these days they'll also find Vikram Vij at My Shanti. For 20 years, Vij has spent most of his evenings working the room at Vij's, making it a destination restaurant unlike any other in Canada. With My Shanti, he sees an opportunity to elevate the food choices in the suburbs. He also indulges in showcasing more of his recipe book, filling the menu at My Shanti with regional dishes from India. Anyone who has been to Vij's knows the cuisine is a blend of European technique and Indian flavours. My Shanti is more traditionally Indian. "These are the dishes I've wanted to share with people for a while. 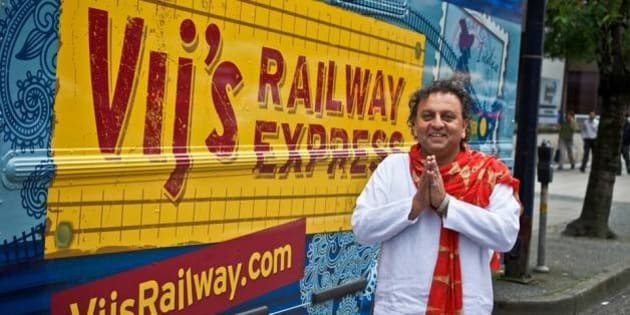 They are from different regions of India, from places I've visited many times over the years," says Vij, who juggles his time between the restaurants, his packaged food product line and numerous TV appearances, including as an upcoming member of CBC's "Dragons' Den." Though the cuisine at My Shanti isn't the same as Vij's or Rangoli -- the small eatery next door to Vij's on Granville Street that's also often packed with diners -- some of the experience is unmistakeable. The spices that are so sublimely blended together you don't realize there are dozens of them in each bite, the texture of perfectly prepared basmati rice, the heat that hits the back of your throat after you've enjoyed the other flavours first. Those are all hallmarks of Vij's food and it's what you'll discover in the Indian dishes at My Shanti. "This really is just like Calcutta fish," Mariellen Ward, my dining companion, said with both joy and surprise when she bit into the steamed tilapia ($19.50), served with mustard gravy reminiscent of dishes from the capital city of the state of West Bengal. "This is really is like being back in India." Ward is an excellent person to gauge the authenticity of My Shanti's recipes. Her website, BreatheDreamGo.com, has been recognized as a leading authority on travel to India and she has visited the country several times in the past decade. She assured that the menu accomplished Vij's aim of giving diners a culinary tour of his homeland. Dishes evoke the diverse tastes of the Asian nation. The names on the menu tell diners the origin of the appetizers and entrees. Mysorian vegetable thoran ($15) is a curry mixed with delicious grated coconut; Hydrabadi chicken biryani ($22) is served with Vij's "3 Mistresses" -- spicy sauces that include tamarind and chili concoctions; and Goan Oyster Pakoras ($11.25) are tasty morsels breaded in chickpea flour and served with a tangy green chili creme fraiche. There are also Bollywood references and colloquial Hindi phrases used on the food and cocktail menu (try the rum-based Dawa Daru, $11). The standout, though, is a flavourful appetizer inspired by South America. The Peruvian/Indian ceviche of fish and shrimp features the seafood dropped into a gol gappa (a thin, crisp, hollow, bite-size bread bowl) and served atop a non-alcoholic shot of tamarind juice. Pop the seafood-stuffed gol gappa into your mouth and throw back the tamarind shot. Unique and incredibly tasty. As good as the food is, the decor is a match -- starting with that shimmering exterior. It is made of 4,000 sequins, affixed by hand to tiny hooks attached to a brick wall. The wind ripples through the sequins, causing a lovely wave of silver to streak above your head. Whether diners will actually make the drive to South Surrey is to be seen -- although the wait staff reports that some guests have already come from Vancouver and Burnaby. The restaurant isn't quite up to the standard of Vij's. The kitchen is slow and Vij admits the employees need to become more knowledgeable about Indian food. For now, the dishes are prepared in Vancouver by Vij's brigade of female chefs from Punjab who follow recipes developed by Vij and his wife, Meeru Dhalwala. My Shanti's kitchen staff plates the dishes and makes the naan that accompanies the entrees. "Vij's is more modern. Here, it is really going to feel like India. You will be surrounded by India," Vij said with his usual mix of pride and passion, "it will engulf you."